I’d love to plan a trip somewhere far away from the dreariness of winter. Instead, I’m revisiting my travels to some of the great gardens of the world. I was in Giverny in the spring of 2000. It was unforgettable. 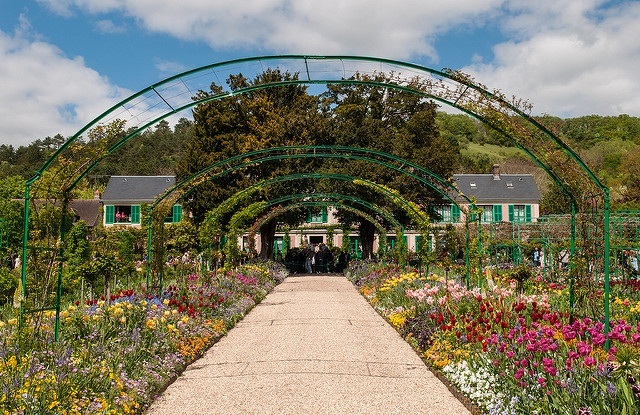 To visit Giverny is to arrive, as in a dream, at a destination that is both unknown and intuitively familiar. You enter through a gate in an ancient stone wall and are at once surrounded by a burst of color so lush and extravagant that the breath catches in your throat. Stretching away to the boundary walls is an orderly regiment of beds, filled to the bursting with brilliant blossoms; squint, and the colors blur into a living facsimile of an Impressionist painting, right before your eyes. Here in the high, northern plateau of France, the weather is changeable, with fronts marching in in ragged succession from the Atlantic. Now, the steely gray clouds move in and dim the colors; a moment later, sunlight bursts through, giving the flowers a translucent glow. You understand at once how Claude Monet could grow obsessed with capturing the fugitive light, the transient ebb of brilliance and shadow. Monet was 43 when he moved to Giverny in 1883, and hard pressed. His wife Camille had died bearing his second son. His chief patron, Ernest Hoschedé, had gone bankrupt and fled, leaving his wife Alice and their six children essentially in Monet’s care. The painter first spotted Giverny, site of an old farm and cider press, from the windows of a train, and talked his way in the door without benefit of rent, on the promise to "take good care of the property." He couldn’t have known that the refuge he found for Alice and the eight children they had between them would transform his life and his art — and make his fortune — but that’s the way of life’s twists and turns. In the early years, before Monet married Alice in 1892, a year after Ernest’s death, the conservative farm country neighbors clucked with disapproval at the couple’s living arrangement. They shook their heads when, after first buying the farm, Monet acquired a separate parcel across the road and dug a pond, filling it with water diverted from the River Epte, a tributary of the Seine. "He’ll poison the water with those strange plants", the farmers said. They would never have imagined that Monet’s meditative paintings of his beloved water lily pond would become among the most famous works of art in the world. Today you reach the water garden through a tunnel built under the busy thoroughfare that has replaced the former sleepy roadway. In the early morning, one of the gardeners (now employed by the Monet Foundation) boards a small skiff and gently skims debris from the surface of the water, just as someone did in Monet’s day, at Monet’s request. It is a little disorienting to witness, a moment of utter timelessness, and you half expect the burly, bearded painter to come down the path with servants bearing his canvases and tools. Every gardener will recognize Monet’s complaint — "All my money goes into my garden" — and his justification — "I am in raptures." Gradually, he stopped looking elsewhere for his subjects, abandoned the haystacks and the poplars and the cathedral façades of his early works, and found in his garden the whole of his inspiration. Found everything he needed. I can picture him, stroking the tulips, grooming the roses, poking a finger in the soil. I see him peering at the pond margins, calculating where his latest plant acquisition might best fit. I feel his spirit still — his gardener’s heart, his artist’s soul. The world is full of deviltry, now as it was then, with great wars about to burst lives and shatter the windows of Monet’s pink stucco house. Search for the angelic in human life, and where would you look, if not to nature and to art? Wandering the paths of Giverny, I lose myself to Monet’s garden, and am deeply grateful that, having been once left in ruins, it has been restored by the hands of those many donors, volunteers and master gardeners who would not see such an outpouring of one man’s vision lost forever. And I am reminded once again that to admire is human; to create, divine.